the network of structures and equipment used in telephone communication. A network comprises switching points, central offices, communications lines, and telephone sets. Telephone sets are equipped with rotary dials, key pulsers, or automatic dialers. The communication lines used in telephone networks take the form of aerial wires and cables, underground wires and cables, submarine cables, radio relay systems, optical (laser) systems, and satellite links. In order to use these lines most efficiently, multiplexing equipment (seeLINE MULTIPLEXING) is used to create a certain number of standard voice-frequency (300–3400 hertz) communications channels. The switching operations necessary in setting up telephone connections are carried out at central offices and at switching points. Depending on their structure and function, telephone networks in the USSR, as in many other countries, are subdivided into local (rural and urban), area, interarea, long-distance, and international networks. With rural telephone networks, each local central office serves between 50 and 200 subscribers. The local offices are interconnected through a tandem office, and the tandem offices are linked through a central tandem office to a toll office (Figure 1). Urban networks having more than one central office are divided into districts. When the districts are fairly small, that is, serving only tens of thousands of subscribers, the district central offices are interconnected, and each one is linked to a toll office. In larger systems, where each district serves hundreds of thousands of subscribers, lines are used more efficiently and multiplexing is more effective when the district offices are linked to the toll office through a tandem office. Figure 1. Simplified diagram of a telephone network: (TS) telephone set, (LTO) local telephone office of a rural network, (TO) tandem office, (CTO) central tandem office, (AGO) automatic central office, (ADCO) automatic district central office of an urban network, (TOI) tandem office for incoming calls, (TOO) tandem office for outgoing calls, (CSP 1) first-class control switching point, (CSP 2) second-class control switching point, (TOLO) automatic toll office, and (INTO) international office. The thin solid lines form a local network, the double lines an area network, the heavy solid lines a long-distance network, and the broken lines an international network. The single dotted line represents a direct interoffice trunk. Usually, the territory of a country is divided into areas according to a numbering plan. The number of areas ranges between 50 and 200, with the USSR having (1975) 160. Each area will have one or two toll offices to handle the incoming and outgoing calls of that area’s local central offices. The toll office or offices, together with the communications lines interconnecting the toll office or offices with the local central offices, constitute an area telephone network. Together, a country’s area telephone networks constitute an interarea telephone network. A long-distance telephone network is formed by a country’s toll offices, control switching points, and interconnecting communications lines. The control switching points are designed to make indirect connections and to map out alternate routes. In telephone networks where central offices are connected to offices of higher rank, direct interoffice trunks can be used to link any two offices when warranted by the volume of traffic. The introduction of control switching points and tandem offices has made possible a substantial reduction in the number of direct interoffice trunks needed to handle all calls in a given direction with a specified quality of service. A quality of service can be maintained wherein no more than 1 percent of the calls are blocked by busy circuits. An international telephone network is farmed by all international offices, transit centers for international, including intercontinental calls, and interconnecting communications lines. Development work on telephone networks is geared toward increasing the level of automation in setting up connections at central offices and switching points and introducing automatic central offices and control switching points that do not need constant maintenance. These offices and switching points will be either electronic or quasi-electronic. With the latter, the control apparatus is made up of electronic components, and the switching of communications lines is done by small, high-speed telephone relays, such as hermetic contacts. 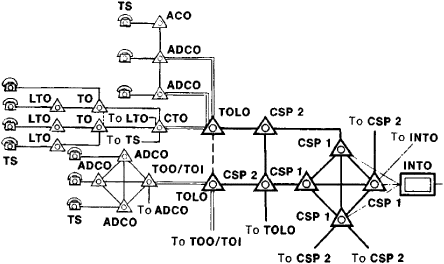 Work is also being done on developing adaptive automatic control systems for telephone networks. These systems include devices for representing, monitoring, and correcting the condition of a network; the devices, acting upon information (the dialed number) received from the caller, search the network for the optimum route of setting up the connection. Microelectronics and electronic control computers are being used in telephone equipment. The telephone network in the USSR is being developed as part of the Integrated Automatic Communications System. Zhdanov, I. M., and E. I. Kucheriavyi. Postroenie gowdskikh telefonnykh setei. Moscow, 1972. Lazarev, V. G., and G. G. Savvin. Seti sviazi, upravlenie i kommutatsiia. Moscow, 1973. Avtomaticheskaia mezhdugorodnaia i sel’skaia telefonnaia sviaz’. Moscow, 1976. The entire telephone network, from the phone to the CO [Central Office, where Class 5 switches are located] is going to ATM, and no one is going to care about things like VoIP with ATM, because ATM doesn't need IP to carry voice," Tom Nolle states. Their integrated VoIP was also used to provide connectivity with the public telephone networks. The course also covers subjects, such as teletraffic engineering and signalling, that are not only relevant to conventional telephone networks but also Voice over IP (VoIP) services. Staples (Nasdaq:SPLS), the world's largest office products retailer, has become the first national retailer to stock PhoneGnome(TM), the new worldwide voice technology product that seamlessly joins Voice over Internet Protocol (VoIP) communications with a customer's existing Public Switched Telephone Network (PSTN) service, allowing consumers to make Internet calls and PSTN phone calls from the same phone. Staples (NASDAQ:SPLS), the world's largest office products retailer, has become the first national retailer to stock PhoneGnome(TM), the new worldwide voice technology product that seamlessly joins Voice over Internet Protocol (VoIP) communications with a customer's existing telephone service, (Public Switched Telephone Network (PSTN)) allowing consumers to make Internet calls and traditional PSTN telephone calls from the same phone. The SIP-based gateway software enables users to seamlessly make PC-to-phone and phone-to-PC audio calls through the standard public switched telephone network (PSTN). According to the Dell'Oro Group report, the transition of telephone networks from the circuit-switched Public Switched Telephone Network (PSTN) to the packet-based NGN is still in an early stage. SAN FRANCISCO -- PhoneGnome(TM), the new worldwide voice technology product that seamlessly joins Voice over Internet Protocol (VoIP) communications with a customer's existing Public Switched Telephone Network (PSTN) service, allowing consumers to make Internet calls and PSTN phone calls from the same phone, is now available for immediate customer delivery from Voxilla on the Voxilla. Until then, TEO LT had been the only provider of public fixed-line telephone networks and services in the country. The author also discusses conventional ISDN SS7-based telephone networks, PABXs (Private Automatic Branch Exchanges) and PC software implementations of PABX functionality, including the open-source Asterisk project.